The South American native has become beloved by Angelenos. The budding (and falling) of the tree’s beautiful purple flowers signals the changing of the seasons in L.A. 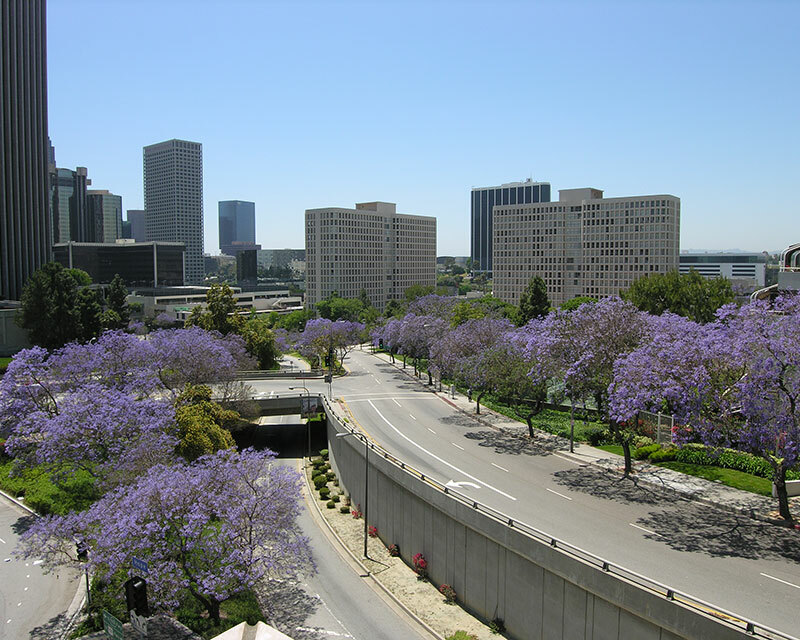 Declared the city’s most exotic tree and the official tree of Glendale, you can see the trees in bloom between May and June at the Central Library, at the Huntington Gardens, or out your car window. 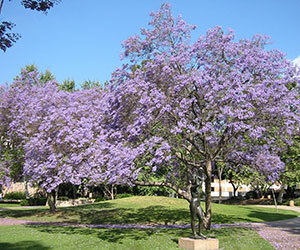 There are over 20,000 publicly planted Jacarandas lining the streets. 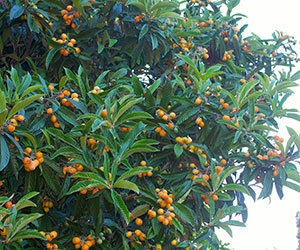 Chances are either you or somebody you know has a Loquat tree in their backyard and doesn’t even know it. The tree’s delicious little citrus fruit can be used to make jams, syrups, dressings, cocktails, salsas, and braises while its leaves can be made into a medicinal tea said to support liver and respiratory health and to combat diabetes. Tip: when using the fruit, leave the skin on and save the pits for some DIY liqueur! Our easy going fuchsia friends adorn walls, gates, and rooftops everywhere. Also in white, pink, purple, and red, “boogies” (as farmers call the tropic-transplants), are drought and heat tolerant, which makes them ideal for home gardens in Los Angeles. 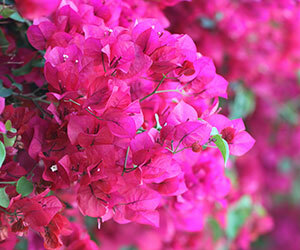 The Glendora Bougainvilliea plant at Bennett and Minnesota Avenues is an official state historic landmark and is the largest of its kind in the country. A Jacaranda relative, the Trumpet is another vibrant flowering tree; we see yellow and pink varieties here in L.A. Trumpet trees have a leafless bloom in the spring that makes them unique, with small and delicate downward facing flowers. They have earned honorable spots in the Walt Disney Concert Hall gardens and the L.A. Arboretum, making them guests at many weddings and models in many photographs. The trees’ leaves have long been thought to have healing attributes and are said to ease everything from stomach issues to cancer symptoms and were used medicinally by South Americans and the Incas. 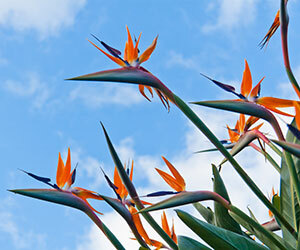 Birds of Paradise, also known as “Crane Flowers,” is the official flower of Los Angeles. Brought to Los Angeles in the late 1800s on whaling ships from South Africa, the Birds of Paradise is a wonderful representation of the multicultural Los Angeles community. If you think the leaves resemble banana leaves, you are right; these flowers are in the same family as the banana plant, although you won’t get any tasty fruit from this one. Find one of these tropical beauties at Union Station, at LAX, and in your neighbors yard. Wherever they are, a hummingbird is surely nearby. 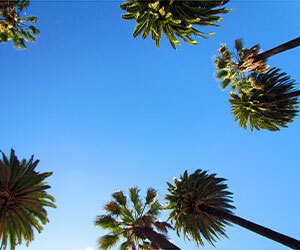 Though we have accumulated a few popular species of palm trees, the Mexican Fan Palm is the one you see on L.A. postcards. In season year-round, palm trees were initially chosen for widespread street side planting in the 1930s because they tend to be hassle-free: they don’t interfere with wires, don’t drop messy fruit or leaves, and have subtle roots that respect the concrete. 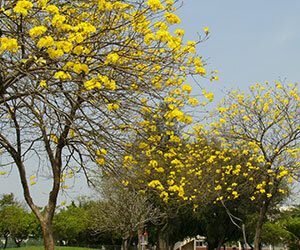 Despite these qualities, the tree’s dependence on frequent watering has led city officials to replace dead or fallen palms with other varieties. Next articleL.A. by the Slice: How Do We Know Our Neighborhood Has Priced Itself Out?